Hello Friends! I've got another Mother's Day card share today. 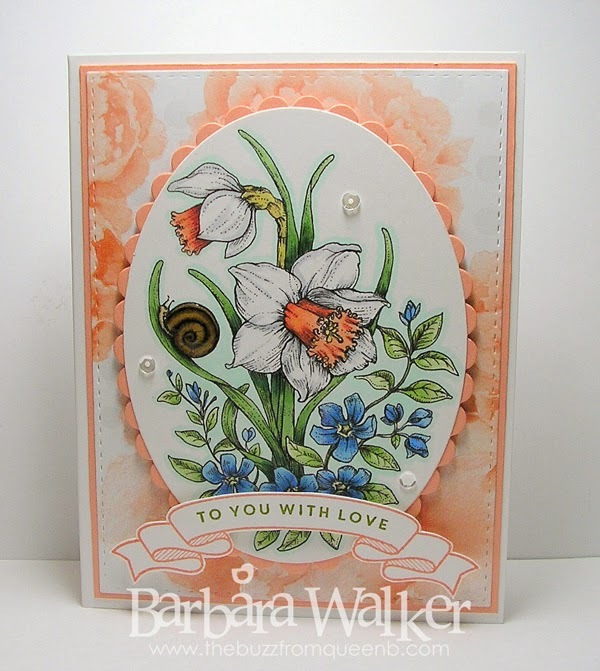 This time I used a digital image from Power Poppy, called Dancing with Daffodils. I've used it before and you can see that card HERE. I really like the quality of the Power Poppy digital stamps. If you haven't visited the Shop, make sure you pop over and take a look. Marcella does a fabulous job with her illustrations, so much detail and her drawings are just gorgeous! I'm a BIG fan, can you tell? I also appreciate that her digital images include a sentiment. As I mentioned in a previous post, Marcella is giving us an Instant Garden; a new floral digital set is being released on the 15th of every month, so if you want to grab some beautiful digis, head on over and sign up to receive her newsletters so you don't miss a thing. Okay...onto the card. I wanted something completely different from the other card I created, so I did a little Goggle search and found an image of a white daffodil and from there, I drew inspiration. 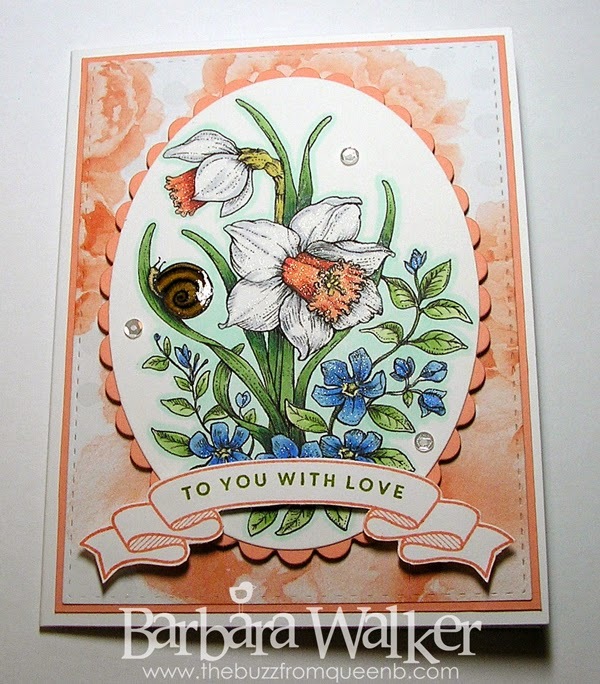 I had already printed my image onto smooth white card stock and die cut it with an Oval Nestabilities die last month, during the 30 Day Coloring Challenge. Coloring was quick and easy. To make the daffodils appear white, I used a cool gray Copic marker around the edges and in the shadow areas. The addition of the cool blue maker around the image really makes the whole thing pop. 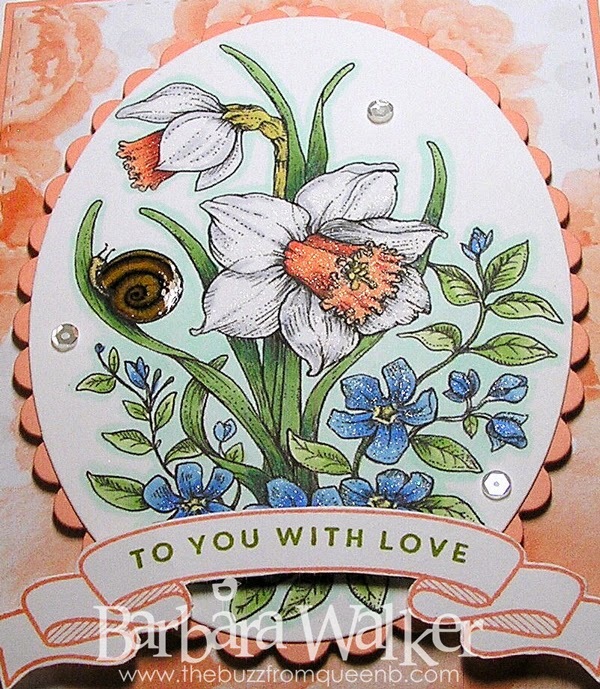 After coloring and matting the focal onto the scalloped oval, I went over the flowers with a Clear Wink of Stella glitter brush and gave the snails shell a coating of Glossy Accents. 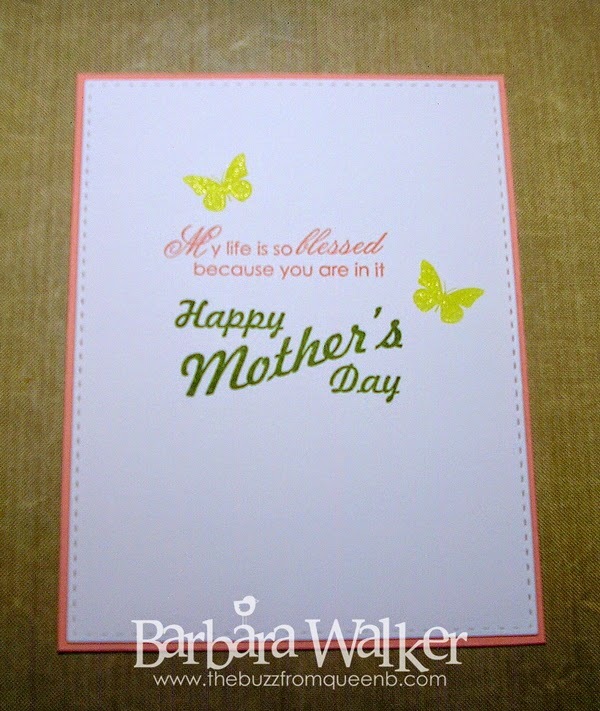 To create the banner, I used the banner and sentiment from the Bloomsies stamp set from Mama Elephant. The set has coordinating dies, but I don't have them, so I just fussy cut the banner and adhered it to my card with dimensional adhesive. The last embellishments I added were the 4mm Sparkling Clear sequins from Pretty Pink Posh. And that is it for today! Thank you for stopping by! I appreciate the visit. Have a wonderful Wednesday. My goodness this daffodil oh boy!! Such precious coloring Barb and your touches of shimmer from Wink of Stella make this little boquet look fresh from the garden! Pinning! Wow that is really beautiful! My favorite color is orange and its awesome to see someone use the color so beautifully. You are very talented! Oh, Barbara, this is stunning! 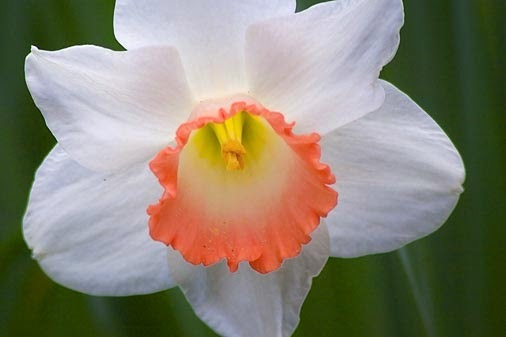 I love the apricot cup on your daffodils and the amazing coloring to pop the white petals! Beautiful DP and perfect layout! Absolutely gorgeous Mother's Day card! Hugs! This is very pretty! Thanks so much for joining us for the Simon Says Stamp Wednesday Challenge!